The singer and his Blue bandmates will be hitting the road this October with the show's other male groups such as 5th Story, 3T and 5ive. "The Big Reunion is such a great show and they are doing another arena tour this year - it's like the boy band special with Blue, Damage, 3T, 5th Story, 5ive and A1," he said. "They're all getting together and doing a bigger Big Reunion tour so it should be fun." Blue were a surprise success after they participated in the first series of the ITV2 show alongside bands like Liberty X, Atomic Kitten, 911, Honeyz and B*Witched. Duncan continued: "It's going great. We're off to Japan next month, which I'm excited about. We're on the road again. And we have another big announcement with Blue, which I am not allowed to say yet, but it is exciting." 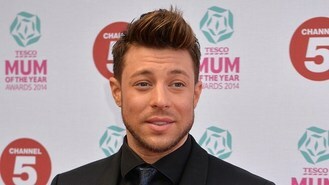 The 35-year-old singer has been watching the second series of the show. "I think it's great. I was really interested in the Eternal story - it was interesting to see about those girls. And I was interested to see about how they put 5th Story together," he said. Tickets for The Big Reunion tour, which begins on October 17, are available now from www.livenation.co.uk.